Three new Canadian films take on contemporary global issues through radically different lenses. Stopping off in an Arctic Russian mining city, the ruins of Basra, Iraq and a massive thermonuclear reactor in Southern France, François Jacob’s A Moon of Nickel and Ice, Ann Shin’s My Enemy, My Brother and Mila Aung-Thwin and Van Royko’s Let There Be Lightinvestigate the entangled issues of history, war, energy and ecology from the bottom up, through intense focuses on individuals and their stories. Quebecois director Jacob makes his feature debut with A Moon of Nickel and Ice, a multi-faceted portrait of the Siberian nickelmining city of Norilsk. 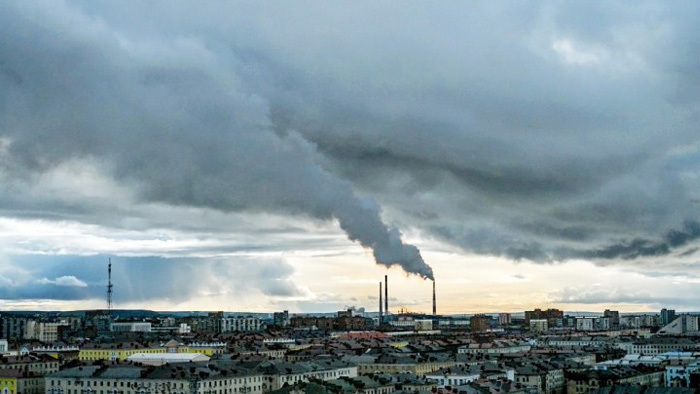 Three facts about Norilsk: It’s the world’s northernmost city with over 100,000 inhabitants; it’s one of the most polluted places in the world; and it’s a “closed city”—foreigners have been banned since 2001, and it was closed to most Russians as well during the Soviet era. Norilsk Nickel’s on-site smelting facility gives the gifts of acid rain, smog and fully 1% of the world’s sulfur dioxide emissions. You may be wondering how they got 100,000 people to move there. Answer: they forced them. Yes, Norilsk was the site of a Soviet Gulag. Those who had run afoul of Soviet authorities were the city’s main inhabitants and the mine’s original workers. They died in the hundreds of thousands—more from pollution-related diseases and overwork than outright execution, in Norilsk’s case. But some survivors and many of their descendants are still there, and to this day Norilsk is still completely dependent on the nickel mine. In that respect, it’s like any number of Canadian and Rust Belt locales, from West Virginia to Hamilton, except it’s still functioning—if paying people enough to stay while poisoning them with the fruits of their labour can be called functioning. But why make a film there? “I have always had a soft spot for Russia and the USSR at large,” says Jacob. “It was such a distinct society, operating under the western radar for over 70 years, that I have always felt strongly inclined to explore it today and to capture what remained of that ‘Red’ mentality, culture and vision of the world. I always had this nagging impression that in the former USSR, behind every face you would cross on the street there would be a tragic story, or at the very least an incredible one. Inspired by those rich fantasies about Russian life and Soviet history, as well as by iconic images of Norilsk by photographers Elena Chernyshova, Sergey Maximishin and Alexander Gronsky, Jacob resolved to make a film about the city. “The project seemed almost impossible,” he recalls. “How do you obtain permission to work in a city closed to foreigners? And how do you get an invitation to go there from people whom you’ve never met, whose language you can barely speak, let alone finance this?” It took five years of grant writing, research and language study; sleepless nights on the phone—accounting for the 12-hour difference between Montreal and Norilsk—with the FSB (the Russian Federal Security Service, the successor to the USSR’s KGB) to figure out the visa procedure; and finally, Maximishin connecting Jacob with Fotoklub Norilska to make it to Norilsk. Even when the stories the older people tell involve imprisonment in the former Gulag, running afoul of the Soviet military, and provoking Russian authorities by publicly commemorating a famous 1953 Gulag uprising, Jacob does not exoticise his subjects. When they reminisce about how cheap flights to Moscow or St. Petersburg were during the Soviet era and admit that they still vote for the Communist Party because it reflects their social values, he is offering us a rare unfiltered gaze into a humanised Russia. The same goes for his younger subjects. The images of Russian youth that filter into Western media invariably involve foolhardy daredevilry, drugs, homophobia, violence and other unsavoury images. By contrast, the teenagers in A Moon of Nickel and Ice are like small-town kids anywhere—they’re a tight-knit community, some with touchingly close friendships; they joke around and go to birthday parties; they love their home even as they dream about leaving. It doesn’t get nearly as much play as solar, wind and geothermal power, and certainly far less than the ecologically disastrous oil, gas and coal do. But if any of the teams profiled in Mila Aung-Thwin’s Let There Be Light (co-directed by cinematographer extraordinaire Van Royko) end up succeeding in their experiments, it will be the solution to the world’s energy problem. They say it will be like a miniature sun, fuelled by common seawater heated to 150 million degrees Celsius, and in all likelihood it will be contained in a multinational, multibillion-dollar facility in the south of France. I’m talking about nuclear fusion. As the world’s highest-profile experiment in nuclear fusion, ITER is the film’s centerpiece. But one of the film’s treats is when it moves away from there to smaller-scale labs, including a hilariously convoluted one hosted in a storage locker in New Jersey. And, says Aung-Thwin, there are many more that he would’ve liked to include: “I went to MIT’s lab right after they lost federal funding, but I didn’t use those scenes. There’s a machine in England called JET, which is very close to passing the breakeven point of fusion; it is a smaller scale version ofITER. Then there are some more secretive private initiatives like Tri-Alpha Energy, and Lockheed Martin’s fusion device. “In general in the fusion community,” he goes on, “everyone is aware of everyone else’s work and likes to talk and gossip about it.” It will take the diverse strategies of that community to make the breakthroughs that will enable fusion. That and tens of billions of dollars. Ann Shin’s My Enemy, My Brother updates her acclaimed short film of the same name, which gained rare prominence when it was featured on The New York Times’ website as an Op-Doc two years ago. “The overwhelming positive response totally took us by surprise,” says Shin. “It was viewed by hundreds of thousands, got nominated for an Emmy, and was shortlisted for an Oscar.” The feature is both an expansion and a sequel. Just like the short, it’s tremendously moving, and Shin uses the feature’s larger canvas to supplement the earlier incarnation’s pure catharsis with more ambivalent and frustrating developments. It’s an incredible story of humanity and chance set against the background of the Iran-Iraq War of the 1980s and present-day Vancouver. Two veterans—the Iraqi Najah and the Iranian Zahed, linked by an astonishing act of heroism and separated by time and imprisonment—reunite by sheer chance in the waiting room at the Vancouver Association for Survivors of Torture. The reunion is cathartic, and the two become as close as brothers. Where the concise short film limits itself to telling this story through interviews and animation, the feature intercuts it among Najah’s and Zahed’s respective attempts to return to their home countries and reconnect with the families they’ve lost. Najah wants to find his wife and son, who he has not seen since he went to war; Zahed wants to reconcile with his father, who is dying. It’s not giving too much away to say that neither quest quite comes off: Back in Basra, Najah has to settle for copious hugs and tears with long-lost relatives and contemplative wandering around his old neighbourhood; Zahed, for political reasons, never makes it to Iran, so he ends up meeting his sister and her family in an Istanbul hotel and talking with his mother and father on the phone and Skype. Harrowing stories abound: Zahed relays a story of his father forcing him as a baby to drink his mother’s milk for three days—after she’d been killed. Najah’s trauma is of a somewhat quieter variety, wandering around muddy, once-paved streets and bombed-out husks of familiar buildings in a search he knows to be quixotic.